Weekly Speller is an old-school app that does a straightforward job with spelling practice. Ron Swerdfeger created it for his own kids to use, and its bright colors and visually uncluttered look suggest that its natural audience would be children in the K-3 range. However, older students could use it, too, since the advantage with Weekly Speller is that users can add their own spelling lists to it. Weekly Speller’s game modes combat the drudgery of practicing spelling words with party colors and activities. There are six play modes in Weekly Speller: Word Scramble, Join Letters, Sentence Complete, Sentence Correct, Word Search, and Words. In the Word Scramble mode, letters float around the screen and the object is to click on the letters in their proper order. Join Letters is a game that presents you with a spelling word, as well as the letters in the word in mixed-up order. As soon as you begin the game, the letters in the word turn into question marks. Your job is then to click and drag the correct letter into each space. 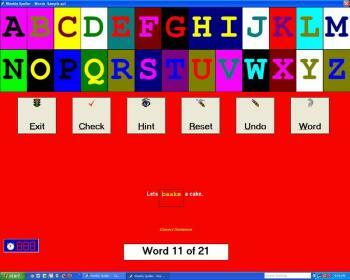 In Sentence Complete mode, the program shows you the spelling word as well as a sentence with a blank space where that word should go (“Let’s play _____ and seek.”) As you begin to type the word (or, alternately, click each letter in the alphabet that appears at the top of the screen in big, brightly colored boxes), the word disappears and you’re on your own. In Sentence Correct mode, you must correct a sentence that contains a misspelled word (e.g., "That doll will soon belng to me.") The Word Search mode creates a simple word search puzzle out of your spelling word list. Users may choose from six difficulty levels, but even at the highest level of difficulty, though some words are spelled backwards and some are upside down, there are no words on the diagonal. Finally, the "Words" mode just shows you one of your spelling words and then waits for you to type it. As soon as you begin typing, the word disappears, and it's up to you to finish typing it correctly. Throughout all these modes, a variety of recorded voices cheer your successes and point out when mistakes have been made. Most of these sound like kids' voices, and some have been modified to sound as if robots or aliens are speaking. To add your own spelling words, use the Edit menu and choose New Spelling List. There will be fields available for the words, as well as for two misspellings of each word and a sentence for use in the Sentence games. I used the opportunity to write silly sentences about my own kids, so they would look forward to finding them. There's nothing wrong with Weekly Speller, but there are more polished offerings developed over the last twenty years or so (e.g., JumpStart Spelling) that are available from online resellers for the same price or less. On the other hand, some of the popular customizable spelling software packages marketed to parents sell for $40-$90, so compared to that the $10 Weekly Speller program seems like a bargain. Weekly Speller breaks up monotony of studying spelling words with activity and visual interest.